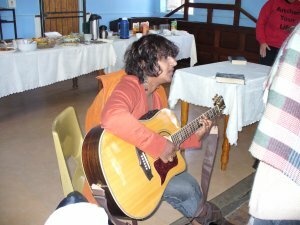 We met Me’ Rose during our first visit to Lesotho in February 2007. 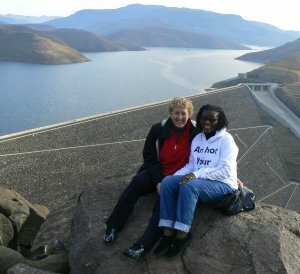 We became fast friends and she became instrumental in our Lesotho ministry. Me’ Rose has such a big heart. She’s always watching for how she can help others. Somehow she seems to know about the most urgent needs in communities, schools and churches…and she gets things done. God has equipped her with an invaluable gift of administration. 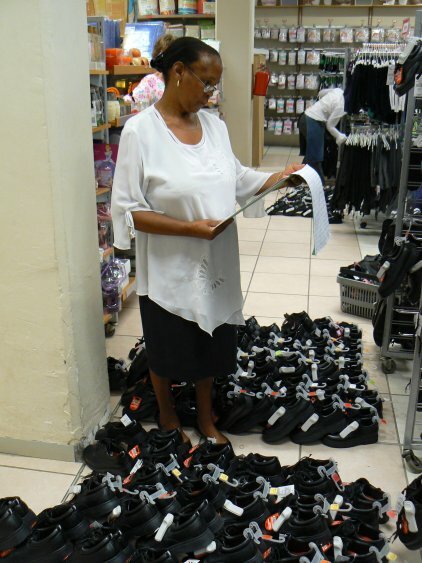 Without fail, when we arrive, she has color coded lists of children’s needs, has arranged for the purchases of clothing, food and supplies, and coordinates our visits. 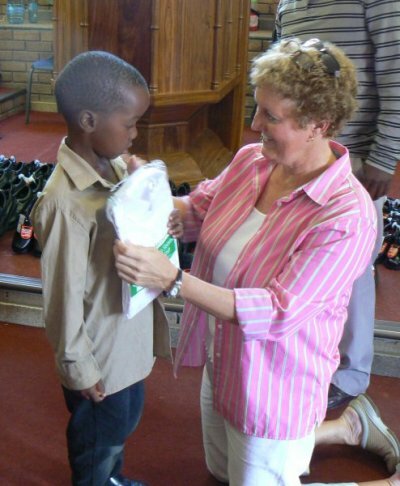 Most importantly she shares with the children and adults why we’re helping. 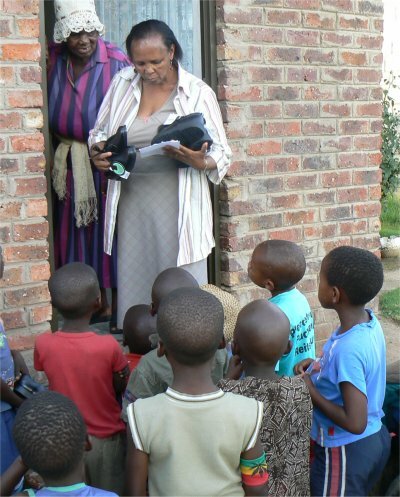 She boldly tells them of the love of Christ and the hope of eternal life through Him. Me’ Rose does not want to miss the opportunity to reflect God’s love to them. She understands that just as the moon refects the sun’s light, she is to be reflector of Son’s light. We always spend a lot of time with Me’ Rose. During this trip we’ll be visiting her home and village again. 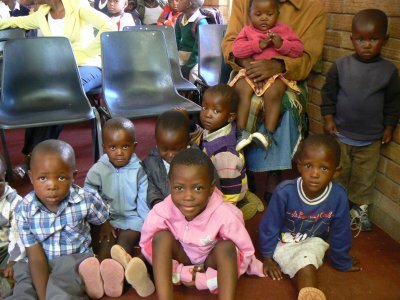 I’ll be eager to see how the children have grown in stature…and spiritually over the past 9 months. We’ll laugh. We’ll share. We’ll listen and we’ll learn. Me’ Rose is a great encouragement as I watch her live for Christ. 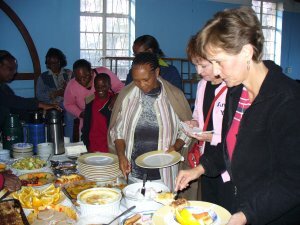 Her sacrificial service challenges me to give more. Her love for God spurs me on to go deeper in my relationship with Him. And her smile brings me joy! I’m seeking to refect Him. How about you? 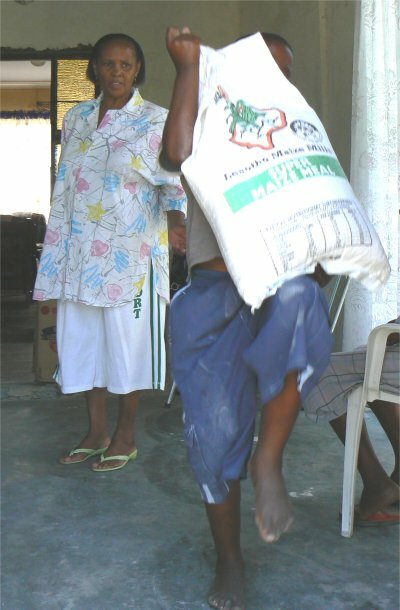 Me' Rose making sure that food goes home to those who are hungry! Only God! Only God can direct a woman living in Ethiopia to visit one website in particular, one out of billions of websites on the Internet. 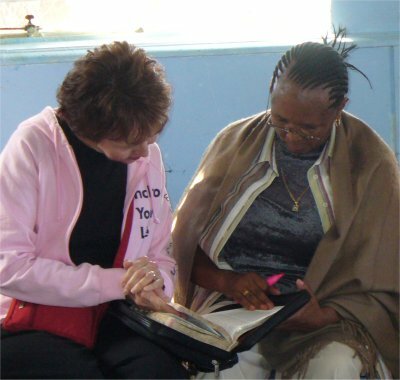 Only God can then develop a deep friendship between two women on separate continents as they correspond via email, sharing their common commitments to Christ and their visions for doing God’s work in the world. 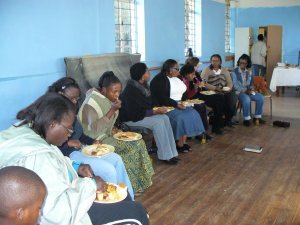 Only God can prompt a church in a small African country to invite a team of women from the US to come and teach God’s Word and encourage their people. Only God! And when our one and only God provides such extraordinary opportunities, I want to immediately follow! 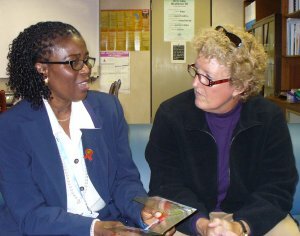 I have known Dr. Angela Benson (Director of the World Health Organization in Lesotho), now from Lesotho, since 1998 when she first visited the Anchor Your Life website and we began to correspond via email. Over the ensuing years, Angela and I have shared God’s Word and prayed for one another many times. 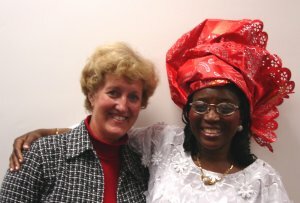 I had the privilege of meeting Angela and her family while they were in Philadelphia a few years ago. God knit our hearts together in Him immediately. Then, I had the joy of hosting Angela in Sarasota two years in a row. 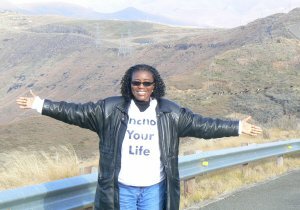 For years Angela has used content from the Anchor Your Life website in Bible studies and small groups in her local church. 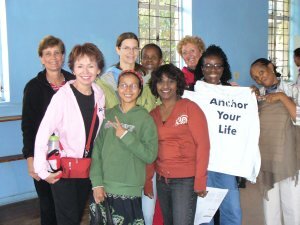 Consequently, many of the people in her church are familiar with Anchor Your Life. God is continuing His incredible work in our lives and in the ministry of Anchor Your Life! 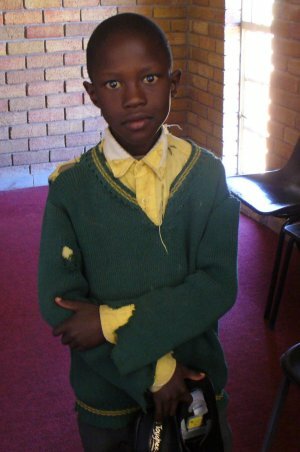 Help us help the children of Lesotho. Make a secure online contribution. Yesterday was a spectacular day in the mountains of Lesotho. We left our hotel very early in the morning to catch our flight with Mission Aviation Fellowship. The plane was a six-seater Cesna. It was beautiful looking down at the mountains.Â They were very green in places.Â It is only green for three months of the year. It was a clear day, so the half hour flight was smooth. We landed on a very short, narrow grass landing strip out in the middle of nowhere.Â When we landed there was no one in sight, but after a brief time a rugged four wheeler pulled up. We were greeted by Pastor Pule, Elias and Me Rose’s daughter, Nthabeleng. The drive was the bumpiest ride I’ve ever been on. Fortunately, it was a short ride to very small village where the Partners in Health Nohana Clinic is located. We were told that most of the people that come to the clinic are HIV infected. 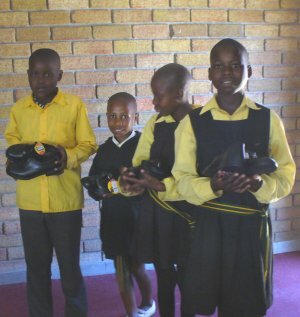 Our purpose was to meet three families that Pastor Pule, Elias and Nthabeleng are working with. They asked if we wanted to walk or drive to the homes. 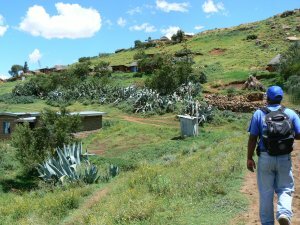 We decided to walk.Â We walked up a hill to a Rondavel (a small hut that is round and made out of sticks and mud with a thatch roof…cow manure lines the inside walls and floor). The family cooks outside unless it is too cold and then they build a fire inside the 10′ diameter hut. It was very clean inside with a couple of benches, a small table and cooking pots and pans. They sleep on the floor on top of animal skins and blankets. The owner of the house is raising her 7 year old grandson. 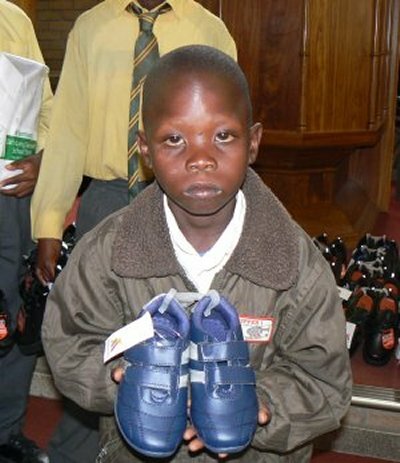 He is an orphan and can not talk or walk. The grandmother was 62 and has to carry the young boy everywhere she goes. It was so sad. We then proceeded to walk to the next house. When asked how far we would walk, the answer was: “It’s just over mountain.” We thought that meant maybe a quarter of a mile walk, but we walked for more than two hours up a steep mountain. It was very rugged terrain. God was watching over us. There were no slips or falls just a lot of huffing and puffing. 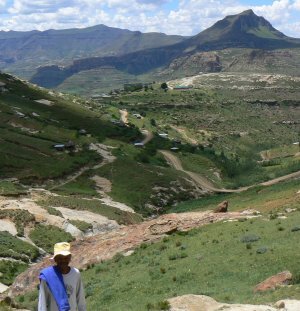 It was a specatular view of the mountainous countryside of Lesotho. Up the mountain…down the mountain…around the valley…and up the mountain again. We finally arrived at the second house. 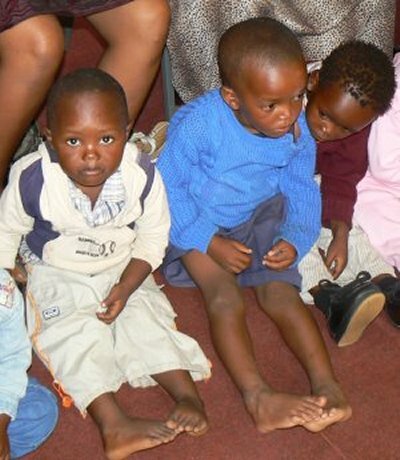 The home is occupied by two brothers who are paralyzed from the waist down. They care for two boys ages 8 and 10. They were in need of food. 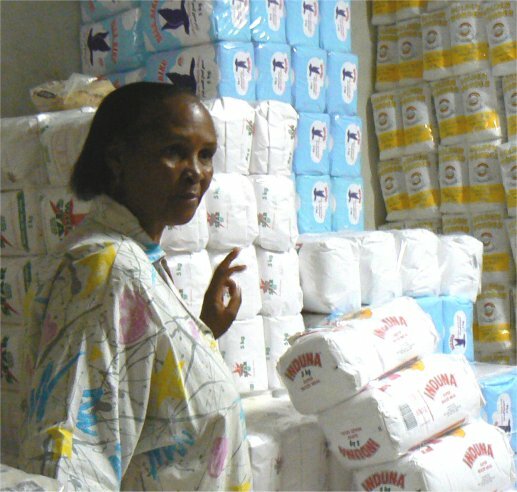 Mike gave Nthableng funds to buy grain for the household. Fortunately, the jeep picked us up and drove us back to the clinic. 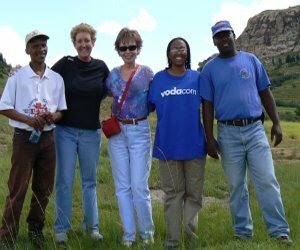 Another walk to the airstrip and we were headed back to Maseru. The trip gave us the opportunity to get a better idea of the country, the people, how they live and the challenges they face. The walk up the mountain was tough but well worth the effort. 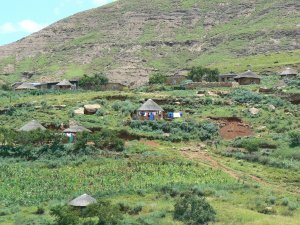 Please pray for Pule, Elias and Nthabeleng as they minister to the people, extend the love of Christ, and share the Gospel with those in remote areas of Lesotho. 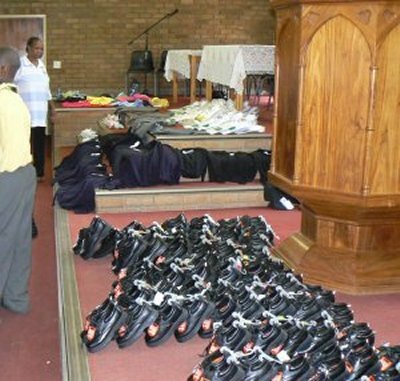 We were thrilled to be able to provide more clothing, shoes, and other school items for the children this year. 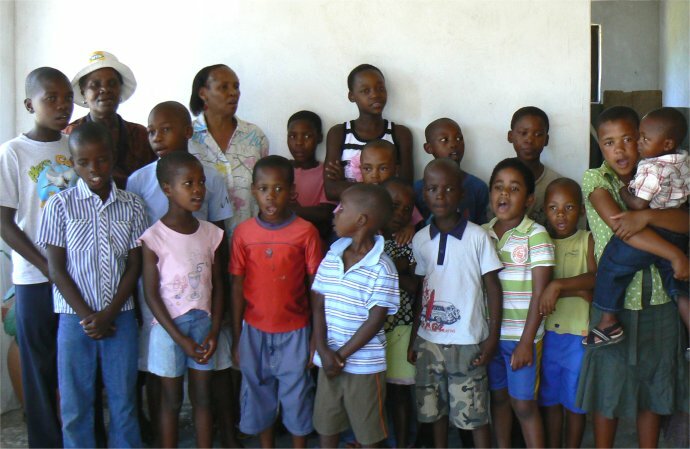 What a privilege it was to be able to help 80 plus children. They were so sweet to us and very appreciative. As they left after 3 hours with us, one young girl reached up to give me a kiss on the cheek. It was a special moment for me. Their smiles and faces will forever be imprinted on my mind. But, we wrestle with the fact that many at the school received nothing. When I went outside for the television interview there were 100’s that encircled me hoping that there was something left for them. Some even peered in the windows from outside to watch those who were the fortunate ones. The needs here are so great. Everywhere you look there are people who need assistance or are sick. It breaks my heart. And yet, throughout the Bible we see that each life matters to God. 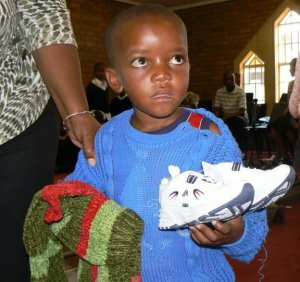 He not only sees the masses in Lesotho that are suffering, He sees each individual. He knows every heart. He created each as His unique masterpiece. And every life we come into contact with is special. 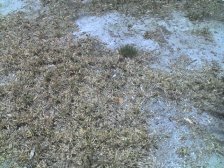 I would love to have 100’s of 1000’s of dollars in my pocket to help. But, right now I want to focus on the children and the people that God places in my path today. Perhaps when we reach Heaven we will hear of how one child was changed for eternity. Thanks for your support, your friendship and your prayers…keep them up! 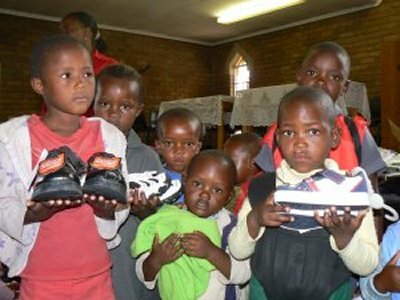 If you would like to assist us with helping the children, make an online donation. The needs are so great! 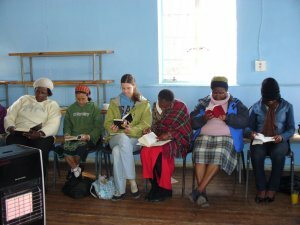 Despite the differences we have with women across the globe, our hearts were knit together as we studied God’s Word. We had a great time of greeting one another, sharing wonderful home cooked meals (Me’ Rose’s pancakes were outstanding! ), singing together, and hearing God’s voice through His Word. 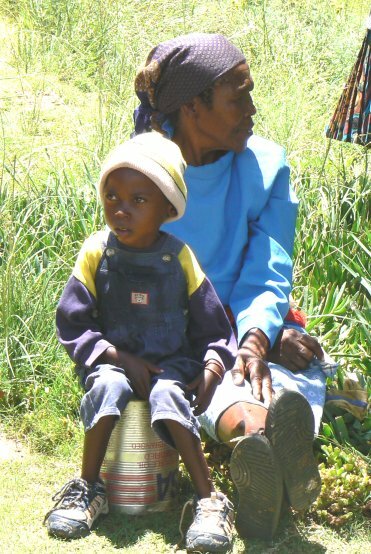 Many women who attended the Bible study are fighting the conditions and the consequences of poverty in Lesotho. But, we heard together from the Word that although our conditions may never change we are to stand firm in our faith, stay focused on God, and continue to pray. 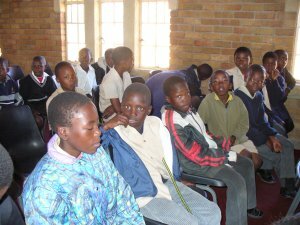 God always speaks in One voice and all were encouraged as many voiced how God had laid on their hearts the need to pray for the Maseru United Church, the people of Lesotho, and all nations. 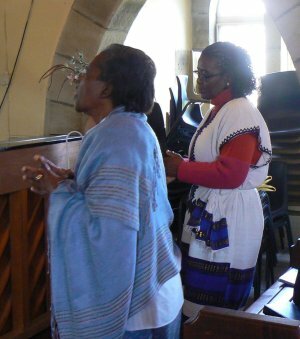 The message was timely for the Global Day of Prayer on Sunday which we will participate. 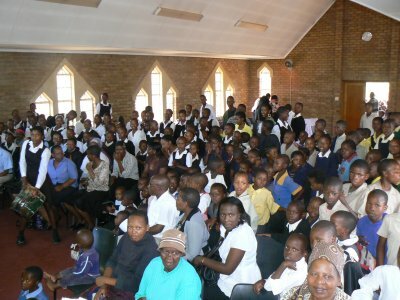 Churches from across Maseru are coming together to pray in the native language. It will by a symphony of prayer for the nations!